We are now getting down to the last few items in the care package. I had a wonderful time going thru all of the wet shaving product from the UK and big thanks go out to Leslie Asare our videos and articles would not have been possible without your generous donations. 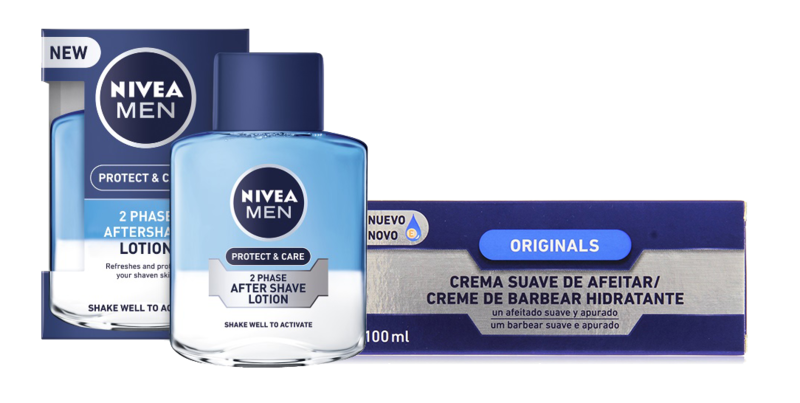 Nivea products seem to be a staple around most of the local drug stores in the US and like all companies that have gone global, some products are only available in certain countries. Take for instance the two products Nivea Men’s Shaving Cream and the 2-phase aftershave. I might have seen the shaving cream but not the 2 Phase aftershave and both are fantastic. The scent of this product is more like a cologne to me and I must say I like it. The shaving cream instructions said I was able to use a brush but it never said anything about not being able to bowl lathering which is exactly what I did making a wonderful rich thick creamy lather only taking less than a minute. As I applied it to my face you could feel how thick it was allowing for great coverage. The excellent slickness and glide with this product allowed me to go over trouble spots without the irritation of any kind. The post shave feel was also one for the books. Now for the 2 Phase aftershave. Once you take the product out of its packaging you can see what they mean by 2 phases. One part is blue the other clear and you need to shake this product before use making sure the two parts are mixed. I almost certain the clear part is mostly glycerin but that’s just a guess. I have to say I really enjoyed this aftershave it felt so good I put it on twice, it’s very slick and it allowed my face to recover from a close shave. I give both products a big thumb up but the only problem is I’m not sure the aftershave is available in the U.S. so if you thinking of getting this for yourself the internet is going to be your only hope.